Related pages: Please see The NRPA Page and the Site Law Page for DEP licensing information, including forms. "Significant groundwater wells" are defined in 38 MRSA Section 480-B (9-A), and became a regulated activity under the Natural Resources Protection Act (NRPA) effective September 20, 2007. Wells that are part of developments permitted under the Site Law have been regulated since the early 1970s. Under the NRPA, a person may not establish or operate a significant groundwater well without first obtaining a permit from the DEP. A NRPA permit is not required if a permit is already required pursuant to the Site Law, borrow pit laws, quarry laws, or Land Use Planning Commission (LUPC) statutes. This avoids regulatory duplication. 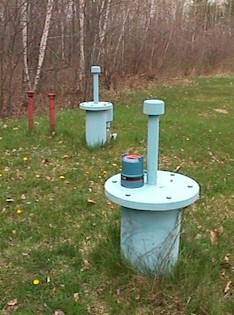 Wells in unorganized area of Maine are regulated by the Land Use Planning Commission (LUPC). LUPC is required to annually review land use standards adopted by the commission to ensure that the standards afford a level of protection consistent with the goals of the NRPA. As required by PL 2007, ch. 399(14) and (15), as amended by PL 2009, ch. 395(3) and (4), the DEP has adopted rules to require significant groundwater wells to pay an annual fee based on the volume of water withdrawn. The fee is used to support the technical review and assessment of monitoring information submitted to the DEP.